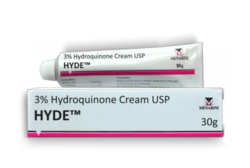 We are offering Hyde Cream to our client. Glycolic acid, an alpha-hydroxy acid, is used in the aesthetic industry as a cosmetic product. Glycolic acid is an effective skin care product that can improve the skin care against wrinkles, age spots and fine lines. Glycolic acid exfoliates dead cells and rejuvenates new skin cells that can develop healthy, young-looking skin. Brand: Galderma India Pvt. Ltd.
Drug Name: Galderma India Pvt. Ltd.
We are dealing in Anti Pigmentation Cream. 1) Masoor dal is used to exfoliate the skin, tighten the pores, brighten your skin, & remove tan. 2) Rice powder has natural anti ageing sandalwood powder prevents & cures pimples also removes sun tan. 3) Sandalwood powder prevents & cures pimples also removes sun tan and oil absorbing properties, makes it good for oily and dull mature skin.